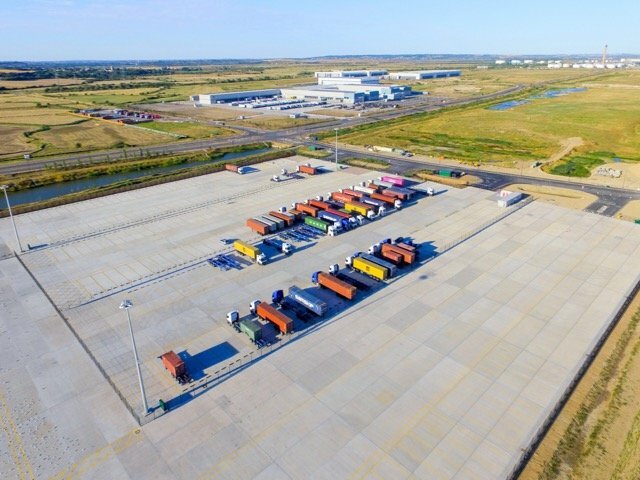 A truck park operated by trailer fleet vehicle management company Hireco has opened at DP World London Gateway Port and Logistics Park. The five-acre yard offers short and long term parking for to up 170 trucks at any one time. It opened its barriers to drivers on Monday, 3 September 3 and is located on a larger truck park plot adjacent to the port’s main gate, and off the main artery road of the Logistics Park. A host of services and facilities will be introduced at the yard over the next couple of months, including Marlon’s Bistro on the Port – a restaurant which will be open every day, showers, toilets, WiFi, vending machines, CCTV and ANPR (automatic number plate recognition) and AdBlue facilities. Parking at the yard is £2 per hour for the first five hours and £24 for six to 24 hours thereafter. Contract parking will also be available from £85 per space per week. DP World London Gateway operates the UK’s fastest growing deep-sea container port on the same site as a 9.25million sq ft Logistics Park for warehousing and distribution facilities. It is located just a few miles from the A13 and 10 miles from Junction 30 of the M25. “We are pleased to have opened our new truck parking facility at DP World London Gateway. We have a good track record of running parking facilities like this one – with a successful operation in Dublin Docklands,” said James Smith, Managing Director, Hireco at the opening of the new facility. Drivers can find the new truck parking facility by turning left onto Ocean Boulevard after coming down the port and park’s main access road, and then turning right at the first set of traffic lights. Hireco’s yard is the last of the entrances on the right, with the remaining eight acres of the overall truck yard being occupied by ATL Haulage Contractors, Wincanton and Seven Linc.